« We are the only dealer…. We use Paypal for safe, secure and easy transactions. We also accept personal checks or USPS money orders. 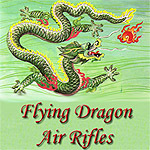 E-mail us at flyingdragonairrifles@hotmail.com or call Phone#- 515-924-3699 to order. This entry was written by Mike, posted on February 11, 2019 at 8:42 pm, and filed under News/Announcements. Welcome to our blog here at Flying Dragon Air Rifles. Here on these pages we’ll be bringing you the latest news, special offers, sales, new services, and just all around cool stuff that’s happening with our store. Bookmark and check back often as we regularly offer some of the best deals on custom tuned air rifles that you won't want to miss. We are the only dealer…. David on We are the only dealer….